It took only a short while after our article on the Japanese artist Takanori Aiba for SMN contributor Mat Irvine to email us this pic of his neat UK competitor. The Rickshaw Trike motorcycle was painted in bright colours to match the sort of gaudy schemes seen in bustling towns and cities across Asia. 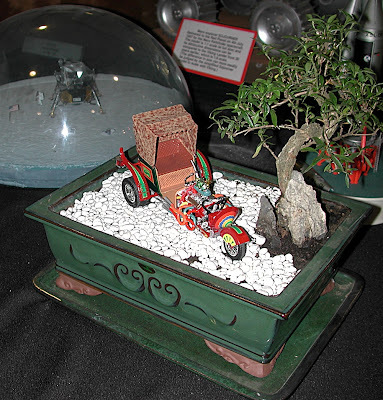 Mat’s bonsai tree certainly fits the bill so far as theatrical presentation is concerned, as does the ceramic urn that holds tree and bike. We’re not sure what scale or kit the Trike came from, but doubtless we’ll find out and report in good time. Note the other model behind the Trike - it’s a 1:72 scale Apollo lunar landing diorama, laid out in a nifty circular section of specially-made moonscape. The perspex dome is a good touch - it looks very ‘spacey’ as a display device. Mind you, such specialist items can be expensive, so it’s worth looking around for cheaper options. We found a slightly weird polycarbonate ‘Squirrel Dome and Feeder Shelter’ which could be deconstructed and used for scale display purposes. There’s a link to the device below. Takanori Aiba doesn’t have it all his own way! We’ll be using bonsai trees as alien growths to set off our own current sci-fi project, a stealth Millennium Falcon. Maybe they’re not rickshaws, but these sidecar models and kits are worth a look here. Squirrel Dome and Feeder Shelter here. Bonsai trees here and here.